Aides close to ousted Yemeni president Ali Abdullah Saleh say he will be retiring to an Addis Ababa villa in Ethiopia. Aides to former Yemeni president Ali Abdullah Saleh said Monday that he plans to go into exile in Ethiopia. The news that the longtime Yemeni leader might depart for Ethiopia is only the latest turn in Saleh’s tortuous exit from power. Rumors have circulated in recent months of Saleh seeking refuge in several countries, including Oman and the United Arab Emirates. The aides told al-Arabiya that Saleh will leave Yemen within two days, along with some of his family members, and will settle in a villa in Addis Ababa. A diplomat in Sana’a confirmed on condition on anonymity that arrangements had been made for Saleh’s departure for Ethiopia, Gulf New reported. Saleh has been under heavy pressure from Western and Arab countries to leave the country, and has faced repeated requests by his newly elected successor and the transitional government that Saleh depart. Newly inaugurated President Abd-Rabbu Mansour Hadi – Saleh's former deputy – was sworn in as president on Saturday following an election aimed at ending more than a year of political turmoil. Hadi was the only candidate, but is widely seen as an honest broker for reform by both opposition leaders and remaining members of Saleh's old guard. A power-transfer deal – backed by the US and brokered by the six-member Gulf Cooperation Council – gave Saleh immunity from prosecution in exchange for ending his 33-year rule. Saleh’s permanent departure from Yemen was not formally required by the agreement, but it was generally understood by all parties that he seek a new home aborad. It was widely feared that if Saleh stayed in Yemen permanently he would incite riots among the masses, and seek to wield influence through a powerful network of well-placed family members and allies. The U.S. Embassy in Sana’a declined to comment and the Ethiopian Embassy could not immediately be reached for comment. Saleh’s erratic behavior – as well as his absences from the country – during the tumultuous year of unrest that rocked Yemen is widely seen as having stoked tensions and uncertainty in the country. Three weeks ago Saleh departed Yemen for the US to receive additional treatment for wounds sustained during a June 2011 assassination attempt, and again it was hoped that he would remain abroad. However, Saleh insisted on returning to Yemen for Hadi's formal inauguration. It was the first time Saleh and Hadi appeared in public together since the now-former president’s departure for medical treatment in Saudi Arabia after the attempt on his life. “Two years from now, I will stand in the same place to transfer power to (another) newly elected president,” Hadi told the gathering. 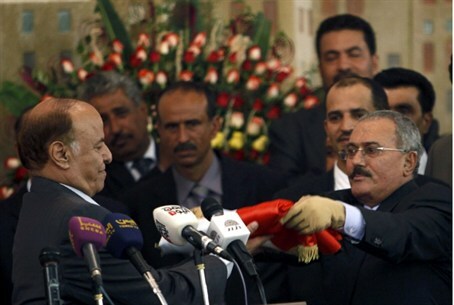 Saleh then passed a Yemeni flag to his successor. According to the transition of power deal that saw Saleh replaced by Hadi, a new president and a new parliament are to be elected within two years and a new constitution should be in place. But the ceremony did not sit well with many Yemenis. Tens of thousands of protesters took to the streets, calling for Saleh’s prosecution.